The Maroon Bells in Aspen Colorado is one of our favorite places on earth they inspire fear and awe with their beauty. 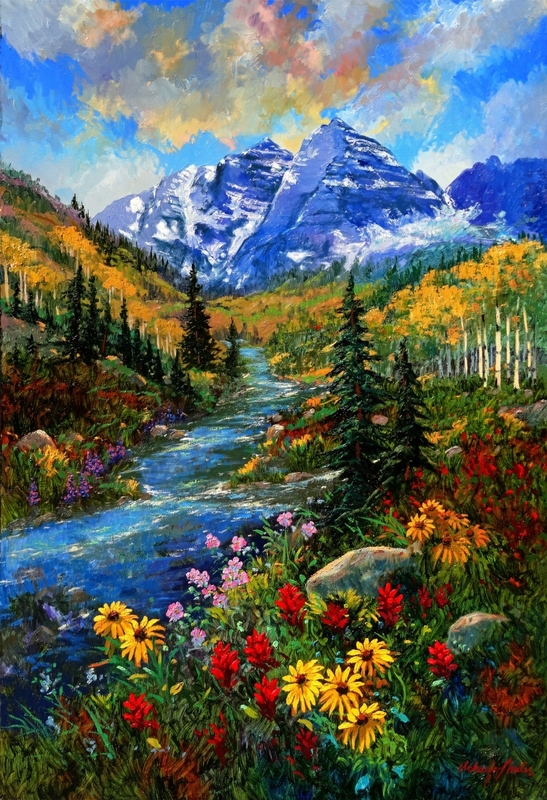 Late summer is depicted in our painting “Trail to Maroon Lake” with brilliant wildflowers and cascading waters of Maroon Creek with Aspen trees just starting to turn gold. We hope you can visit these glorious mountains and feel their grandeur through our painting. This original oil has sold to a happy client but we are more than willing to discuss creating a custom original of your very own from our reference material or yours. We can discuss size, style and colours. Satisfaction guaranteed! We want to spread happiness and joy with our art! Free shipping and custom framing are available!